In this cold winter we love to celebrate our weekends with some hot and spicy snacks. Most of the weekends we have gatherings sometime in my place sometime in friends' place. Last week we had a small get together in one of my friend's place and they told me to prepare some chicken snacks. But I was really not in a mood to cook which would take lots of time. 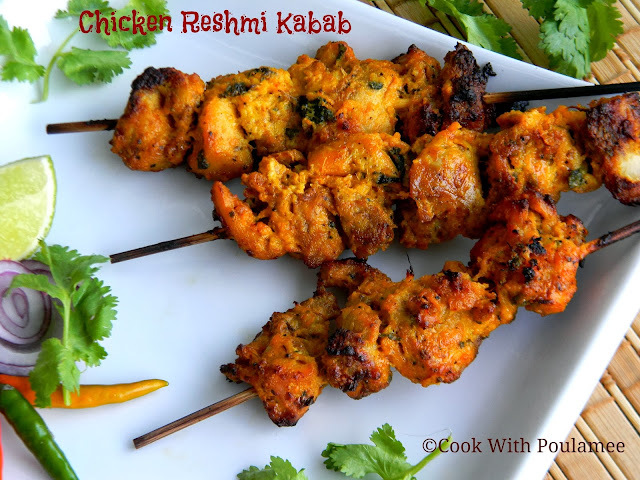 So I chose an easy recipe CHICKEN RESHMI KABAB, an authentic kabab which melts in mouth. 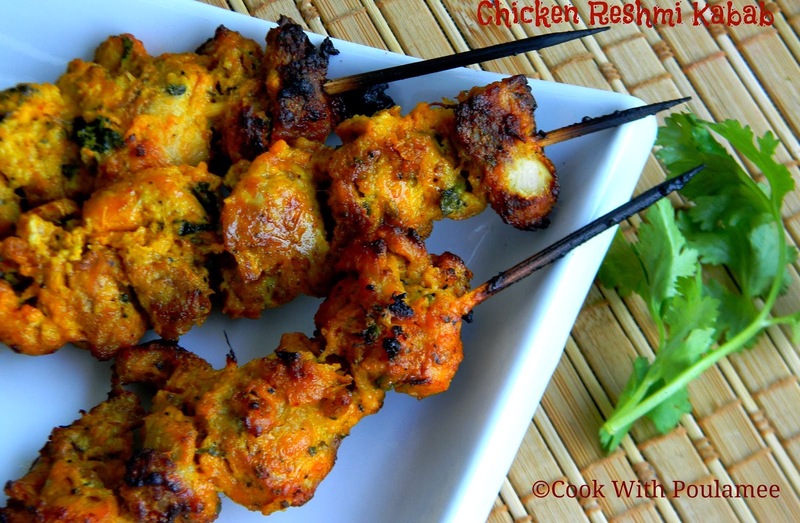 All my friends love the kababs so I thought to share my recipe with all my followers. 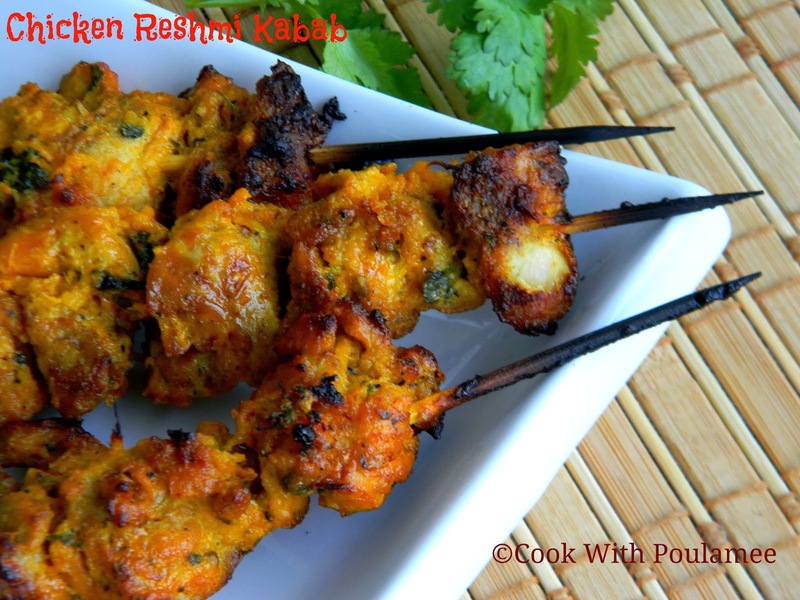 You just need the proper ingredients then you can easily make this KABAB, a perfect snack Item for any party. 2.Black pepper powder: 1 tea spoon. 3.Red chili powder: 1 tea spoon. 4.Kasoori Methi: ½ tea spoon. 5.Orrange food color: Few drops. 6.Cumin Powder: ½ tea spoon. 7.Garama Masala Powder: ½ tea spoon. 8.Meat Tenderizer: ½ tea spoon. 9. Salt as per taste. 1.Haeavy cream: 1 ½ table spoon. 2.Shreded Mozzarella Cheese: 2 table spoon. 3.sour cream: 1 ½ table spoon. 4.Ginger Garlic paste: 1 table spoon. 5.Lemon juice: 1 table spoon. 6.Oil : 1 table spoon. Wash and clean the chicken breasts now cut them into some thin long stripes. 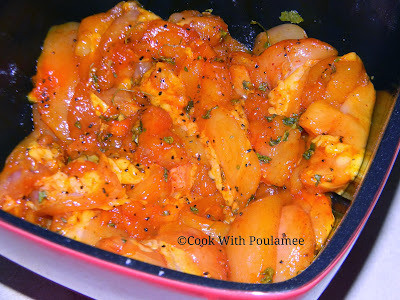 Marinate the chicken stripes with the first round marinating ingredients as mentioned (from 2 to 9). And keep it aside for 30 mints. Now in a bowl add all the second round marinating ingredients together and mix well. 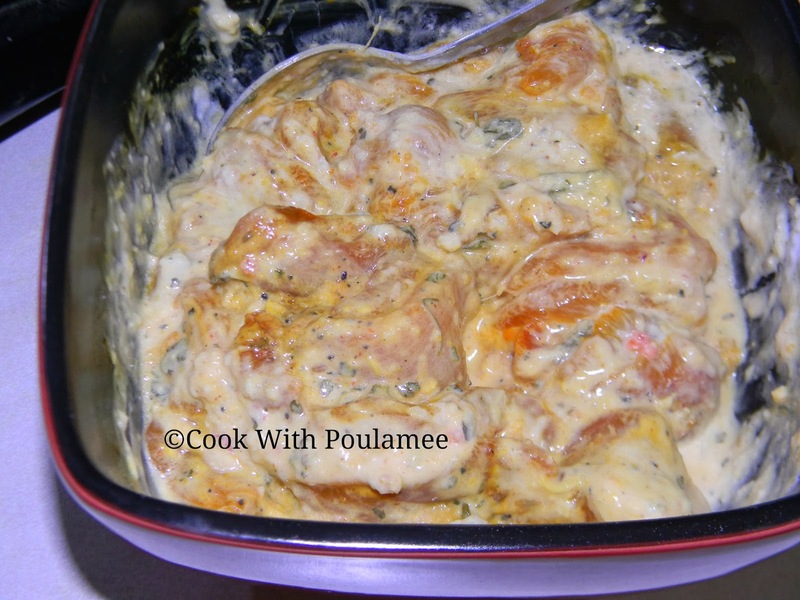 Now put the chicken stripes into the bowl and mix well. 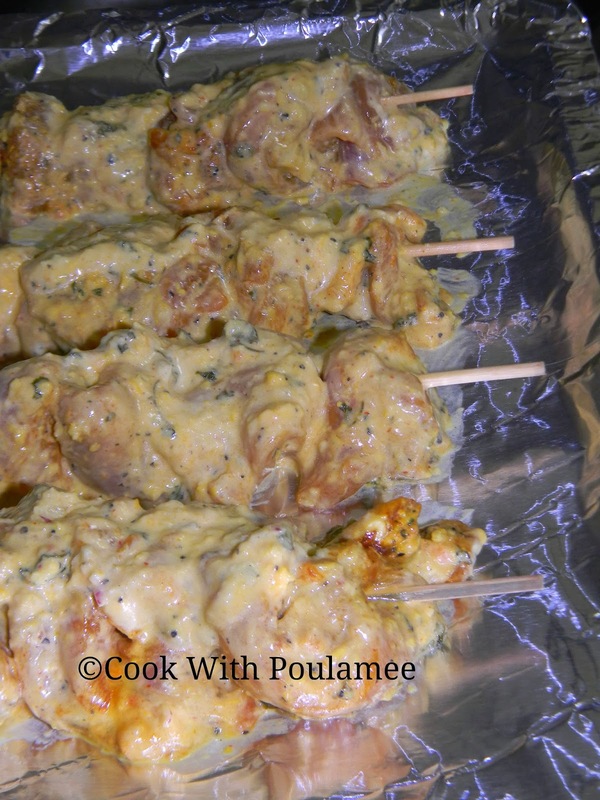 Now Skewer the chicken pieces. Just skewer the chicken pieces from one end to another end. (If you using bamboo skewer please soak them into water for 10 mints). Now Place the skewers in an oven proof tray and cook them in a preheat oven for 15 to 20 mints in high temperature. 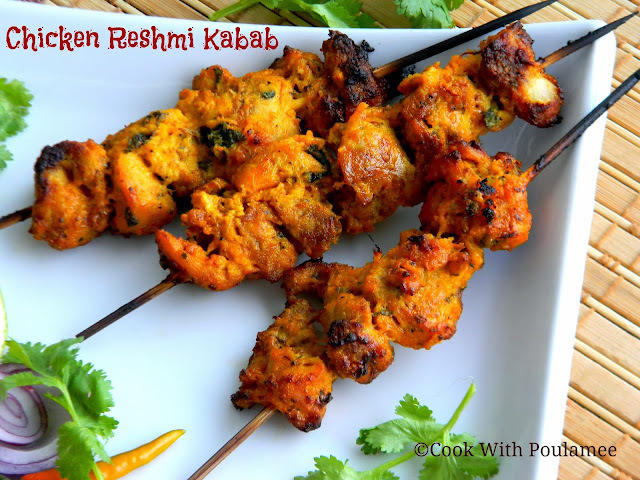 Your easy CHICKEN RESHMI KABAB is ready serve hot with few drops of lemon juice and Onions.